Ron Hatchell checks in tonight with a review of a terrific sixth scale monster from Sideshow - the Hunchback of Notre Dame! Take it away, Ron! "In one of his most famous roles, Lon Chaney portrays the role that dubbed him The Man of a Thousand Faces; the hunchbacked bellringer of Victor Hugo's famous French novel. The production of 'The Hunchback of Notre Dame' was Chaney's longest and the most expensive of his entire career. 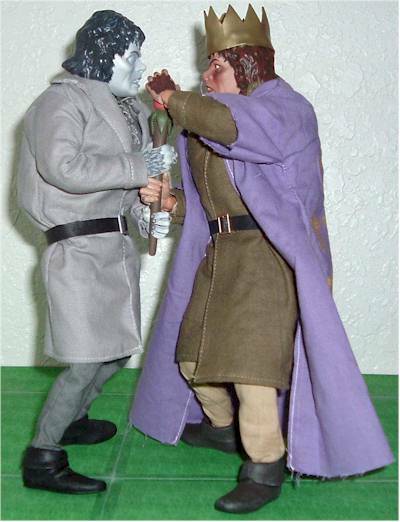 The Hunchback of Notre Dame figure utilizes a modified & slightly shorter male body, while retaining the full range of articulation that you expect from Sideshow figures, perfect for full standing in hunched crouch. 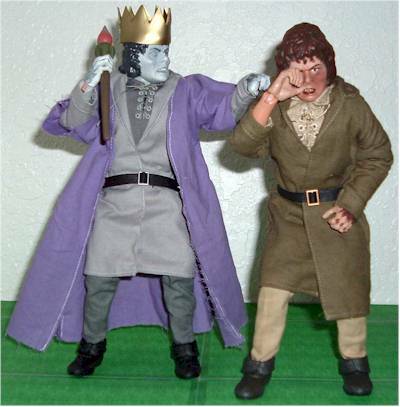 The Silver Screen Edition Hunchback of Notre Dame figure comes with a crown, scepter, cape and 12 inch figure display stand." First, it was my intention to actually get hold of a copy of this movie and watch it before I did the review, but I have not had the time to do this and this figure has been out for a few weeks already, so I decided to review it without seeing the movie so others could actually read it and get some useful information (hopefully). So, I can only compare this figure with stills from the movie I've seen. I'm sorry. The front is a glossy picture of the movie poster of "The Festival of Fools". This is the image of the woman and a goat dancing on a small stage in front of the Hunchback and other onlookers. The back of the box shows a large black-and-white image of the Quasimodo's face, plus three smaller photos from the movie. The inside cover shows the credits. The box inside the package that contains the plastic mold is without holes again, as the one twisty tie that usually holds the neck onto the plastic mold stops there, so the inside cardboard box is without holes. There were also five twisties securing his waist, arms and ankles onto the plastic mold. Plus the plastic strip that supports the legs. Two more secure the stand, and some "dental floss" securing accessories. The inside of the box that holds the plastic support mold shows a picture of what looks like the entrance to the cathedral with Quasimodo lived. The body's figure stands at 11.5 inches. 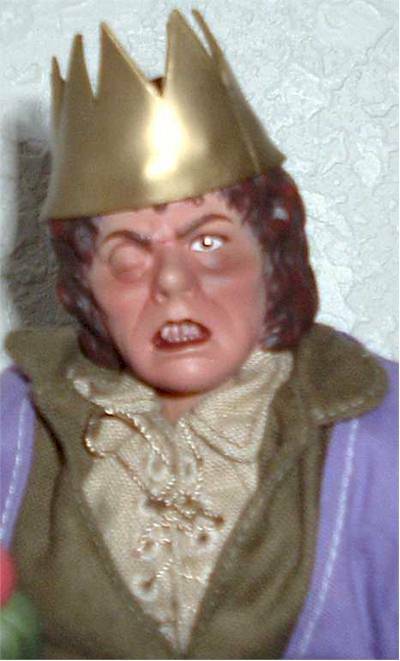 The head sculpt was done by Mat Falls. This is an excellent likeness of Lon Chaney's portrayal of Quasimodo. This is from the scene near the beginning where he is crowned "King of (the) Fools". His face looks great, with his right eye swollen and closed, and his left eye open. His cheeks are swollen looking and somewhat discolored, especially the left side, which looks like he's been bruised from being beaten up. His teeth show his front top row and the very top of his front bottom row, and he has dark red lips. There is hair on most of the top part of his hands, and the first part of the top of his fingers (different from the website prototype, which has no hair on the hands). On his right hand, his four fingers are jointed together (this is a different hand than shown on their website prototype figure). The fingers on his left hand are separated with space in between and his two main fingers (for-finger and index) are joined together near the tips. Both hands can hold his scepter very easily and with a tight grip. And, of course, his hunch, which protrudes about 1 inch from his back. His hunch is really a soft padded pillow-type black material that is strapped on his back and secured around the front of his chest with two straps on either side that are sewn to a cloth material that looks like a shirt on the front of his chest. This can be adjusted up and down some, so you have a little flexibility as to where the "hunch" can be moved to. His hair on his head and hands is painted dark brown with some black added to show the shading. The hair on his hands is different from the prototype shown on their web page. His face seems a few shades of flesh-colored, as it is either dirty in this particular scene and/or one or both of his cheeks are grayish from being swollen and possibly bruised (again, sorry, I haven't seen the movie). He has a few red-looking wrinkle lines on his face. His nails are flesh-colored with a light bit of pink. His shoes are a darker brown than shown on the prototype on their website, with what appears to be silver or gray specks that give the shoes a look very worn-looking appearance. The head can turn completely around and move up and down about a quarter of an inch either way. There is full, realistic range of motion on the shoulders, elbows, forearms, wrists, waist, hips, top of his legs, knees, and ankles. His wrists and ankles also turn completely around. I have been very pleased that all of the newer Sideshow figures I've received in the last several months have been able to stand on their own, without support from their display stands. Great job on the clothes! His tan shirt is single and double-stitched, with the sleeves going all the way down past his wrists with a collar and some very well-stitched holes on the top half of the shirt where a tie "laces" up the holes to close his shirt. His single-stitched pants are a different shade of tan, with an elastic top which should keep it from slipping down any, and the legs of the pants extend all the way down an tucked inside of his shoes where you cannot see the bottom of them. His jacket is single-stitched, has a collar and the length extends down to his upper calves. 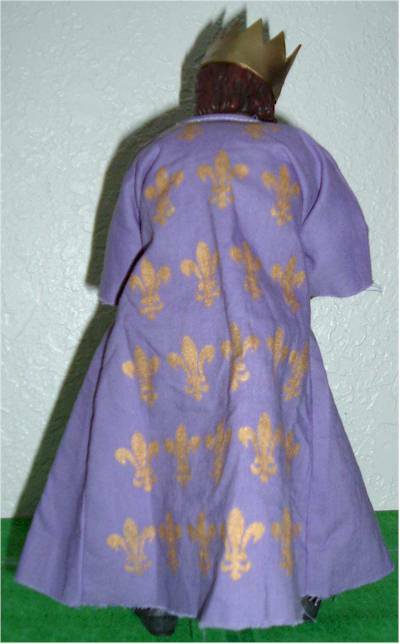 His "cape" is a light purple with gold symbols of something (not sure what) covering the entire back of it. The sleeves of the cape extend down just past his elbows and the length of the cape extends down to his shoes (if he is standing in an upright position). It is single-stitched on the sides and around the inside opening, with no stitching on either the bottom of the sleeves and the cape itself. His belt is about 3/8 of in inch wide and it is long enough to go through the buckle and continue for another 1.5 inches. This makes it much easier to work with, and less likely to come undone. Great job on the belt! 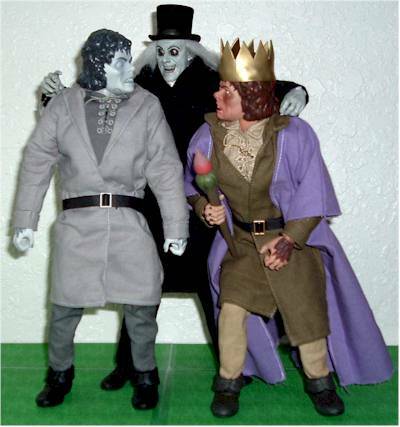 A "Hunchback of Notre Dame" stand is included, which is black with green letters and a Universal Monster icon (in this case, Frankenstein), but the stand is not needed the figure stood very well by itself without the stand's support. His other three accessories are from the scene where he is crowned "King of (the) Fools". His "cape" has already been discussed (see "Outfit:). He also comes with a gold plastic crown that fits securely over his hair, to the point where I can see the some of the outline of his sculpted hair through the crown. His fourth and last accessory is a scepter, which has a brown handle, green leafy petal-looking things that hand down from the top, and above it is what looks like a red flower "bud" or "bulb", with some silver or gray shading at the top of it. I apologize that I am not sure what this scepter is supposed to be. I spent about 30 minutes doing internet research and came up with nothing. Well, I don't know many adults who have seen the 1923 version of the movie, let alone any children, but for children, he might seem pretty scary looking and well-made for children to play with and accessories that are pretty sturdy and should hold up to some normal play. For those who have seen the movie, well, you know what you are getting and he is one of the really great Lon Chaney roles. Both figures (The regular version with 2,000 made at $40.00, and the Silver Screen Edition with 500 made at $45.00) are listed at Sideshow's website as "IN_STOCK" for the US/NON-EU Status and "PRE-ORDER" for the EU Status. He is very well made with tight joints and excellent designed clothes and a great likeness to the Lon Chaney version and, being one of his most well-known performances, is a great value for the price. He is more than ready for great looking poses or playing, whichever one might prefer. While the Silver Screen Edition is $5.00 more than the standard Sideshow price, it is also made in lower quantities and another needed edition to Sideshow's great Silver Screen line-up. Outstanding in almost all aspects. Unfortunately, I am not sure if the crown is supposed to look like this, with the imprint of his hair showing through, but if this bothers anyone, it can be removed, as it wasn't something he wore for the entire movie anyway. Everything else looks great and functions perfectly. - Fireside Collectibles has him for $33. - Killer Toys has him for $40.